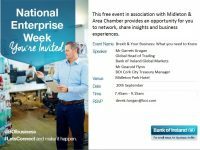 September Chamber Breakfast Meeting on the topic of Brexit and business. We’re making a few changes! It’s Midleton Arts Festival Weekend 2018 from Friday 11th to Sunday 13th. Midleton & Area Chamber wishes to remind members that our Monthly Members' Meeting for May will be held at Castlemartyr Resort on Thursday 3rd May at 8.30 am. Busy start to 2018 in Midleton Tourist Office! Keep up to date with all our latest news and events by signing up for our Newsletter, following us on Facebook and Twitter or our online Calendar.